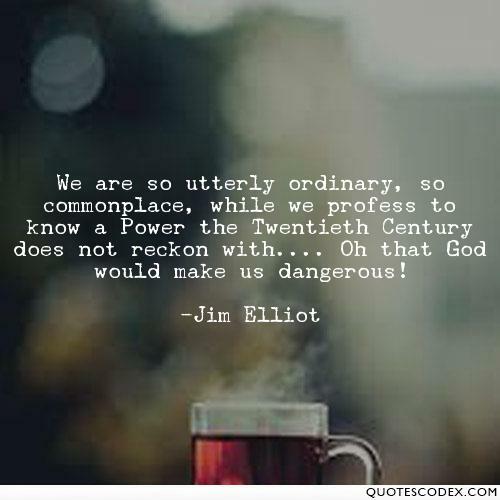 Oh that God would Make Us Dangerous! You are here: Home / Changing the Nation / Oh that God would Make Us Dangerous! First. Seek God first; before you worry about tomorrow, before you seek your own welfare. Notice it doesn’t say, ” Seek first the approval of men.” or ,” Seek first to preserve your life.” No, it says to seek God first. That means we need to preach the gospel of Jesus Christ before everything. This is going to offend some people. Jesus was a pretty controversial guy! He wasn’t the harmless, nice guy that He’s been made out to be- no, he was dangerous! His mere existence offended and angered people, let alone what he preached and did. It is my hope and prayer that we don’t lose sight of what is most important in this life. I pray that we remember just how great our God is, and how tiny and small- sighted our own perspective is. I think it’s when we truly realize just how great the things He’s done for us are that we can become dangerous, warriors standing unashamed of our God. Never wavering from the Truth and reveling in the might of our great Savior.